What a joy and blessing it’s been to work through the book of Colossians with you. We are studying Colossians over at HelloMornings, using the six-week study “Complete in Christ.” It’s not too late to join us! The “whole world.” We know when Paul made this statement, it had been about 30 years since Jesus death and resurrection. But, really? The gospel was already spread to the whole world? When I read that the first time, it made me stop and think. Considering there are still unreached people groups in the world today, Paul’s statement can’t be true at face value. I did a little research and a few ideas resonated with me. The first idea is that this statement is hyperbole. An obvious exaggeration to emphasize a truth. We see this used throughout the Bible. And it seems it was a commonly used figure of speech in the first century. The second idea, is that it was a “prophetic prolepsis.” You can read the article I read about these two ideas here. But basically, it’s making a statement about something that will happen as if it’s already happened. Yes, it’s true that Christianity was spreading at an incredibly fast pace. A pace that can only be explained by the power of Jesus and the work of the Holy Spirit through early believers, like Paul. But, Paul’s statement to the Colossians was one of incredible faith. He spoke as if it had already happened. And boy, can we learn a lot from his example. Paul knew about the language of salvation to the “end of the earth” in the Bible (we looked at it in Week 1 of the “Complete in Christ” study)(Is. 49:6, 52:10). His words to the Colossians echo these Old Testament statements. His knowledge of the Word was solid. Next, Paul believes that these things will come to pass. His language gives us confidence and leaves no room for doubt. Paul was not giving lip service, to simply excite his audience. His words were loaded with faith. He spoke as if it were already so. Finally, Paul’s life was dedicated to making these statements a reality. 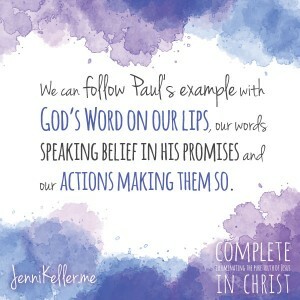 At great cost to Paul, his action showed he believed what he said. And his statement about the gospel spreading to the whole world? We are a part of it. What I love about the Bible is how all its promises and all its “prophetic prolepsis” statements, extend to us. Paul’s faith extends to us. His marching order are ours. In the great work of advancing the kingdom. Of sharing the gospel to the whole world. To the whole world and to that sister, who is far from God and wrestling with faith. It reaches to her, too. 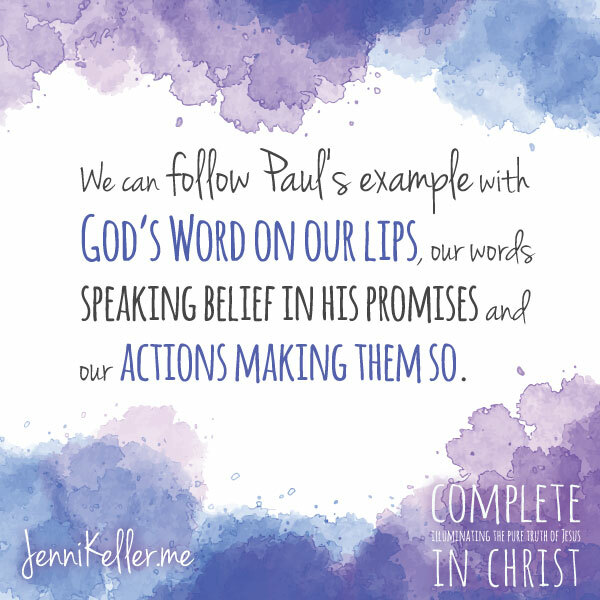 We can follow Paul’s example with God’s Word on our lips, our words speaking belief in his promises and our actions making them so. Paul’s statement in faith and our invitation into the story, means that we, in faith, continue God’s work to that sister and to the ends of the earth. How did God speak to you through Colossians this week?